JAKARTA, Indonesia, November 9, 2010 (ENS) – Cooperation on climate change and the environment is a central pillar of a new Comprehensive Partnership announced tonight by Indonesian President Susilo Bambang Yudhoyono and U.S. President Barack Obama. President Yudhoyono said the new partnership will encompass the areas of trade and investment, education, energy, climate change and the environment, security and democracy, and also civil society. Today for the first time, President Obama returned to Jakarta, the city where he spent four years as a boy while his mother, Stanley Ann Dunham, worked as a government relations consultant with the American oil company Mobil. Dunham married Indonesian geologist Lolo Soetoro, Obama’s stepfather, with whom Obama lived with as a child. Tonight at a state dinner in Jakarta, President Yudhoyono presented the late Dunham with the highest state award, a gesture which “deeply moved” President Obama. “To strengthen cooperation in science and technology that fuels growth, we are going to be pursuing joint research in areas like energy and biodiversity conservation,” said President Obama. The two leaders agreed to enhance cooperation in the area of clean energy, and President Yudhoyono invited the United States to participate in the development of geothermal energy, one of Indonesia’s great sources of renewable energy. 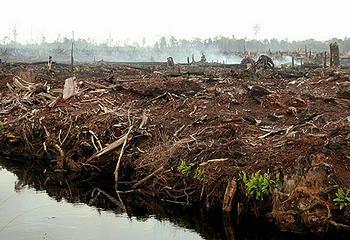 Greenpeace today challenged the United States to increase the financial support it gives Indonesia to reduce deforestation. The funding, part of the US-Indonesia Comprehensive Partnership, includes US$7 million for the establishment of a Climate Change Center and $10 million initial funding for projects to protect peatlands. 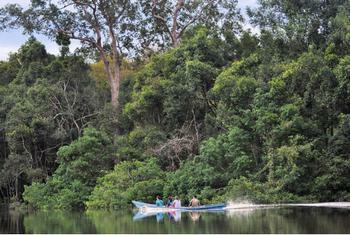 The U.S.-Indonesia agreement includes $119 million for the Science, Oceans, Land Use, Society and Innovation partnership, which encompasses a second Tropical Forest Conservation Act agreement, and the Forestry and Climate Support Project. “While we welcome greater cooperation between the U.S. and Indonesia to tackle deforestation, these funds are inadequate when compared with the scale and impact of deforestation in Indonesia,” said Rolf Skar, senior campaigner for Greenpeace USA. “In addition to increasing this funding, the U.S. must ensure the money is spent wisely, prioritizing protection of natural forests, peatlands and the welfare of communities that depend on them,” Sklar said. At the upcoming United Nations climate talks in Cancun, Indonesia is expected to announce details of the agreement it is negotiating with Norway, which offered US$1 billion in forest protection funds earlier this year. Central to the deal is a two-year moratorium on new concessions to destroy forests and peatlands, expected to start January 1, 2011. “To be effective, the upcoming two-year moratorium must be extended include the millions of hectares of forests already slated for destruction by palm oil and paper companies and in addition, full protection must be given to carbon-rich peatlands,” said Bustar Maitar, forest campaigner, Greenpeace Southeast Asia. 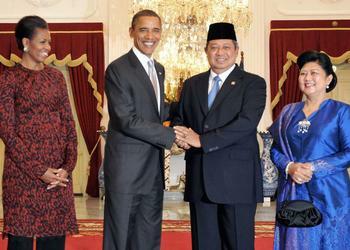 Foundations for the Comprehensive Partnership between Indonesia and the United States were laid earlier this year. In March, the two nations signed a Science and Technology Agreement providing a legal framework for expanded bilateral cooperation and collaboration on science-based decision making, health sciences, energy, marine research, and the environment. Once it enters into force, the agreement will allow for the creation of a Joint Committee on Science and Technology Cooperation. In June, the United States announced it would support Indonesia in establishing a Climate Change Center that will link science to policy on strategic priorities. While the design of the Center is still under discussion, the United States is moving forward to implement cooperation, as well as discuss new forms of technical assistance that will assist Indonesia to both mitigate and adapt to climate change. The Millennium Challenge Corporation, a U.S. government foreign aid agency, is negotiating a large, multi-year compact to promote economic growth and poverty reduction, for submission to its Board of Directors in 2011. The negotiations are focused on “green prosperity, access to economic opportunities, and governance,” according to a statement from the White House today. NASA is finalizing negotiations on a Statement of Intent addressing future cooperation with Indonesia on capacity building and education, Earth science applications for societal benefits, scientific data exchange, space weather monitoring and research, and measuring and monitoring emissions and the impacts of climate change. The U.S. Environmental Protection Agency, together with the Jakarta Provincial Government, has launched Breathe Easy, Jakarta, a program designed to reduce the harmful effects of air pollution in the city. On November 10, local time, President Obama flew to Seoul, South Korea, where he will attend a meeting of the G-20 heads of government to discuss the global financial system and the world economy November 11 and 12.